After such a physical, emotional and spiritual effort to arrive at the cathedral, I set off with a deep ache in my bones that I hadn’t yet experienced, coupled with a pang of loss for my primitivo family. That first day I saw several other solitary pilgrims looking just as bleary eyed and shell-shocked as I did. We mostly kept to ourselves, so I’ll never know whether they were suffering from saying similar goodbyes or simply nursing hangovers from too much celebrating the night before. Each day I made every effort to savor the last moments, and it was slightly worrisome how hard I slept each night. 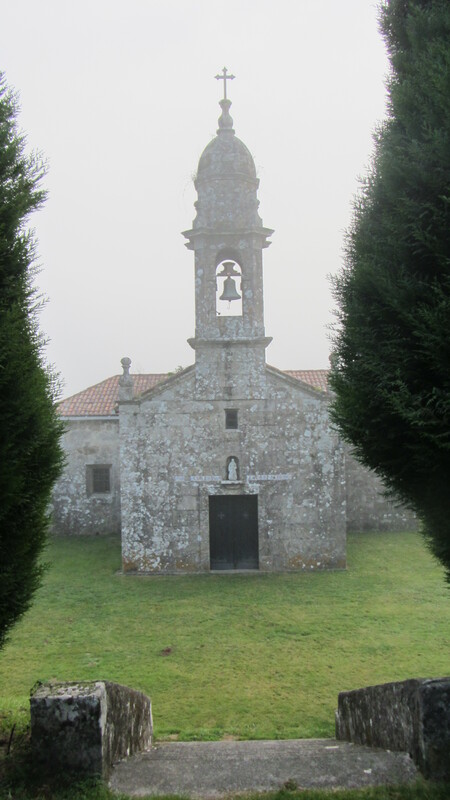 The misty mornings, babbling brooks, moss-covered trees and verdant hills of Galicia continued to impress, as did the food, easily my favorite of the entire trip. I walked slowly, entertaining myself by playing solo games of soccer with the chestnuts dotting the path, and once reunited with the sea in Cee, stopped and swam as often as possible, remembering the curative powers of the ocean when I first began walking. 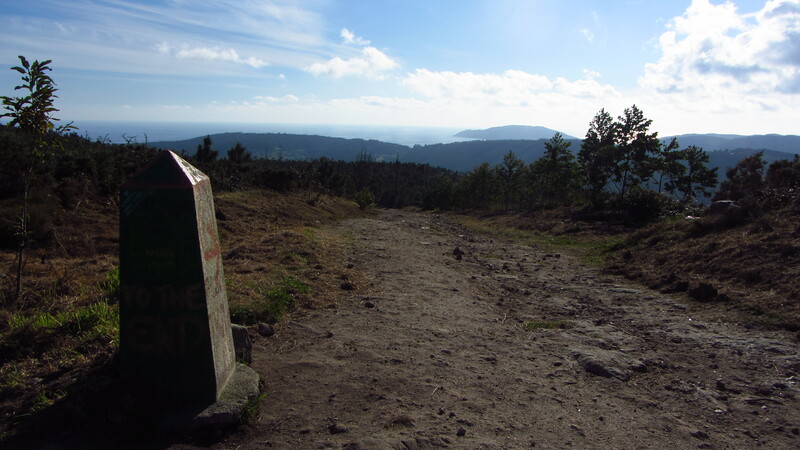 “The camino gives you what you need” was a refrain I heard over and over again, and looking back I found it undeniably true, both in the literal and figurative sense. It is unbelievable just how much I was taught, and although all the lessons might sound trite and cliche, that doesn’t make them untrue. The two most significant events of my camino occurred on the last third of the journey, during that so-called spiritual phase. Early on while walking I began to notice how frequently my mind would wander towards the shame, guilt and anger I was still feeling from the past. By the time I crossed over from the northern to the primitive route it was readily evident just how much I had been carrying around with me, readily accessible right under the surface, and just how heavy this burden had become. 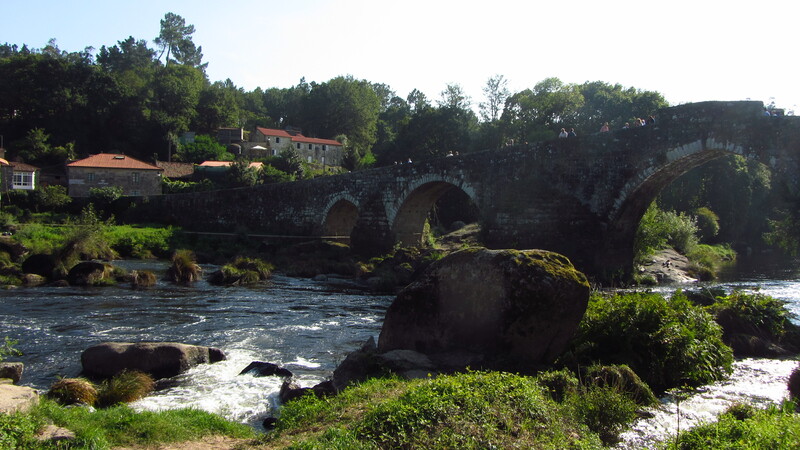 A few days into the primitivo, I arrived at what I heard would be the hardest trek of the entire camino, the Hospitales route. I set off early and almost immediately began climbing up the side of the mountain, my face and hands quickly growing numb from the cold as the wind blew stronger and stronger, until fully leaning into it became the only way to not fall over. Alone and gasping for air, those same painful thoughts returned to haunt me- but this time, the wind began taking them, and one by one each hurt was carried away. At last I reached the top, barren except for a few patches of purple crocuses, the first sign of spring. I rested, catching my breath while leaning against the ruins of an old hospital where pilgrims had come hundreds of years before to attend to their wounds. As it began to lightly sprinkle, a rainbow appeared in the distance through the haze. The rain felt baptismal, and just like that, I was healed. Shoes, shirts, hats and shells left at Finisterre. The second significant event happened a few days after the Hospitales trek, as I was nearing Santiago. I was walking alone through a beautiful stretch of forest, fully present and thinking about nothing in particular. I find it hard to put into words exactly what happened next, but I suddenly stopped and it felt as if my heart had fallen through my body into a deep, calm, endless well of pure love. As I stood there, frozen, I was able to feel that energy not only in me, but in the rocks, trees and stream nearby, and in everyone I had met along the way. It was simple yet profound, and somehow felt like less of a revelation than a recollection. I’ve always been spiritual, but this forever changed my conception of God, leaving me without any kind of word to accurately encapsulate the power, kindness and harmony I experienced in that moment. Reflecting on those lessons, four days later I caught my first glimpse of Finisterre. After checking into the albergue I left the friends I’d made in favor of walking up the hill to the cliff alone, beginning the camino the way I started. Without my bastones there was only the crunch of pine needles and the wind murmuring their congratulations through the pines. Reaching the cliffs and seeing all of the items left by other pilgrims was encouraging, realizing there were thousands of people who had come before and were now out in the world, transformed. I too added my shell that had marked me as a pilgrim to the pile, and then found a spot on the cliff, watching the infinite ocean spread out to embrace the sky, as the sun slowly set. As the light slipped below the horizon, claps and cheers rose up from the crowd and the smell of smoke from bonfires wafted across the rocks. I stopped to have my passport stamped for the last time, getting full body chills hearing Queen’s ‘I Want to Break Free’, the same song that had been playing on the radio the day I was dropped off at the start. Then, I walked back down the mountain in the growing darkness, no longer a pilgrim. Rather than consider the walk to Muxía my last day of the camino, I instead decided to think of it as the first day of a new journey. The walk took me through farmland with traditional homes that appeared unchanged for hundreds of years, and the 27km flew by without a pain or care in the world, the first day I felt as if I could truly walk forever. Throughout the day the sunlight streamed through the trees just so, providing a golden, pine-covered carpet for my arrival, God as a lighting technician. Muxía was another charmer of a town, gulls crying over colorful shoebox houses and water crashing on all sides. 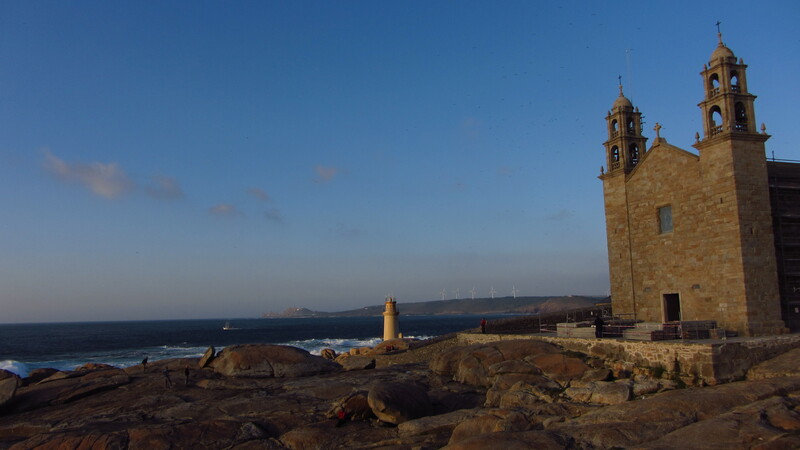 I found a new shell on the beach to replace the one I left in Finisterre and spent some time visiting the Iglesia Santa Maria, located behind sacred rocks from pagan times. What a joy to begin my new camino in a wild place built on a strong foundation, rooted to the sacred earth. The sun set fiery pink over the rocks, glowing the exact same color as my new shell, la vie en rose.